NOUN Definition: The use of art to raise social and environmental awareness, inspiring positive change and action. 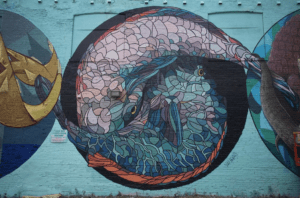 Example: A Love Letter to the Great Lakes is a week-long activation lineup of 21 renowned local and international artists, painting murals designed to stimulate public awareness of critical environmental issues facing the Great Lakes, a true act of artivism within the Toronto community. This spring, Toronto’s first ever international street art festival, A Love Letter to the Great Lakes, took place in Toronto. From June 20 – 25, 2016, a team of dedicated collaborators worked together to explore how public works of art can inspire people to think and act differently about the world’s water resources. 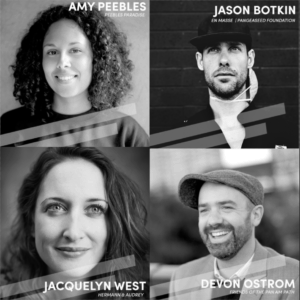 Discover the vision behind this art initiative through a conversation between key festival organizers Amy Peebles, Jason Botkin, Jacquelyn West, and Devon Ostrom. So Amy — where did this concept come from? Also what is your fave photo so far? The concept was born out of the Sea Walls: Murals for Oceans activations that were being spearheaded by the PangeaSeed Foundation. In the interest of continuing to build awareness around water-based environmental issues and wanting to spread the reach of the message, the idea of bringing this type of activation to the Great Lakes was derived. The concept is really rooted in the idea that we should all be cognizant of what is happening to a resource we often take for granted. I have always known this resource to be plentiful/abundant, and recently have started to feel weary of the actions being taken surrounding the use of the water in the Great Lakes basin. 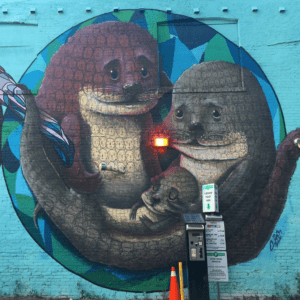 As I am not a scientist or environmentalist, I figured out a way to contribute to bring awareness to these issues using a skill set I do have, the production of public art. My favourite photo so far? Oh, that is tough. I really love the trio done by Sermob, Miguel Valinas and Sens. That wall gives me all of the feelings, especially Sens’ portion. I also really love Jaz’s mural. I have always loved his style. What about you Devon? Jason? How did you get involved in this project? How do you resonate with the concept? 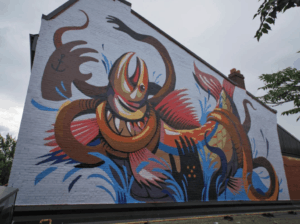 Any favourite murals or moments within the festival? 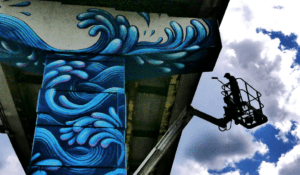 My favourite moment was seeing Jason on the boom, painting waves on the 60’ highway bent below the Don Valley x Gardiner Expressway. The site is such a good reflection of our current relationship with water: you have this potentially beautiful and sustaining river hidden by a spaghetti of highways. Marking that space and making it more visible for the 100,000 daily commuters was really important to me. That is a really important marker for the project and initiative. It is super visible from several angles and could not be more perfect in its message. I am really hoping we can continue painting down there in the years to come and make it a destination for art, in hopes of furthering the message and action. I’ve had the honour of being a past participant of multiple Sea Walls initiatives internationally and was deeply impressed by its mission to empower artists and the surrounding community to make change, using art to tackle and stimulate public awareness to very serious issues in a way that nothing else can. In bringing a unique variation of this platform to T.O., conversations between Jacquelyn West, Amy Peebles and myself began exploring a sort of… regional re-branding which could move away from the ocean based mission and highlight the freshwater concerns. Landing on the idea of a love letter was that perfect, poetic formula, inviting people to express their own notionally positive relationship to the Lakes, across an incredible range of emotions and statement of this sort can encompass. 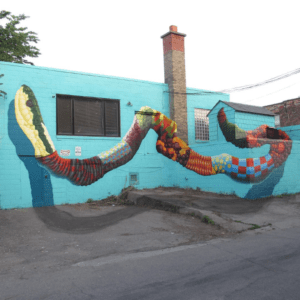 One of my favourite pieces is by local artist, Birdo and his completed wall in the alley along the Ossington strip. I love the vivid palette of this piece and the way he was able to tackle multiple surfaces of a very complex series of walls. Every wall in the festival has a backstory… a series of conversations with the wall owner and the community. This one was a special success story in my mind. Hmmm. True. The way the festival pulled artists together from all over was beautiful. Agreed, that Birdo’s piece is fantastic — I love how it creeps up on you a bit with the shadow across the ground. It needs to be seen in person. You could really see how artists were pushing themselves to do some of their best work due to the the theme and ethos of the event. I wonder what Jacq’s fave piece was? My favourite mural is the piece by Jaz on the side of the new Lululemon flagship store. It was through their patronage that the downtown sites were made possible, and it represents the broader potential of collaborations in public space between commercial brands, the city, and the artist community – in my eyes. To bring together a community of talented creatives, private brands, public agencies, and volunteer citizens toward a cause that affects our natural ecosystem was unprecedented for Toronto. A large-scale environmental message painted by artists of influence who graciously lent their talent to the project. In our moment of unprecedented change and 400 cranes in the air, we are looking at our city as a place for consumers and highest values per square foot, not seeking how we can connect the public to a place and to each other. These murals remind Toronto that we are part of a large community, and together we can affect change. Change does come from awareness raising. I agree that art has a critical role in education — but how do we take it from pointing at an issue with art, to poking at it? I think that art acts as a catalyst for engagement which sparks the conversation, not only amongst the public, but with organizers, such as ourselves and to those who impact policy or who are doing the work on the ground. Through creating the impetus for conversation, we can create platforms of all types to make change. For example: A series of roundtable discussions with policy makers where we have set objectives and mandates can translate into true change. 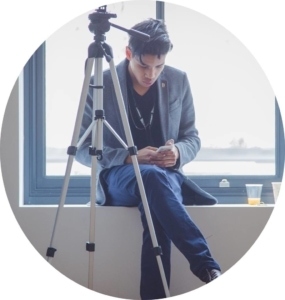 I would reference Devon’s amazing work on creating the Billboard tax that directly funds arts and culture in Toronto. Initiatives like this are a great model and inspiration for what can be done. True. I have found myself thinking more about water issues, and noticed an associated uptick in coverage, but i’m unsure how this it is translated to real action. One thing I have noticed is real change can be pretty slow sometimes. It is true that change on this front can come slowly. However, I’m of the opinion that it doesn’t need to take tons of time. I see our efforts as a powerful attempt to sway the ‘culture of opinion’ surrounding freshwater issues. 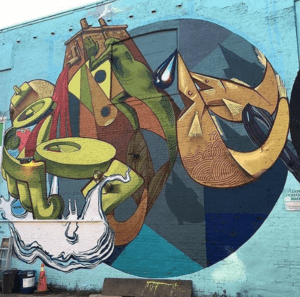 These murals seek to provoke strong emotions within the community, and I believe a community’s commitment to political action is driven primarily by emotions, rather than rational deliberation, practical considerations, and intellect alone. These ‘abstract’ concepts don’t activate people… images do. If in the process we can lead people back to organizations such as Lake Ontario Waterkeeper, by encouraging people to feel an emotional connection to their lakes (like love), and then join efforts to clean our shorelines with organizations such as The Great Canadian Shoreline Cleanup. I feel we’ve hastened the process of change dramatically and made it cool to protect what you love. Follow A Love Letter to the Great Lakes on Instagram and Twitter. Haja is an intern at Matte PR. Former communication lead for a multidisciplinary and immersive art festival in Montreal called Chromatic. Jazz-Hop and Soul lover.